The film 77 HEARTBREAKS (YUEN LEUNG TA 77 CHI) after a week in release has already made HK$ 7.6 million at the box office as of yesterday. The performance was decent. The film company yesterday held an appreciation banquet. 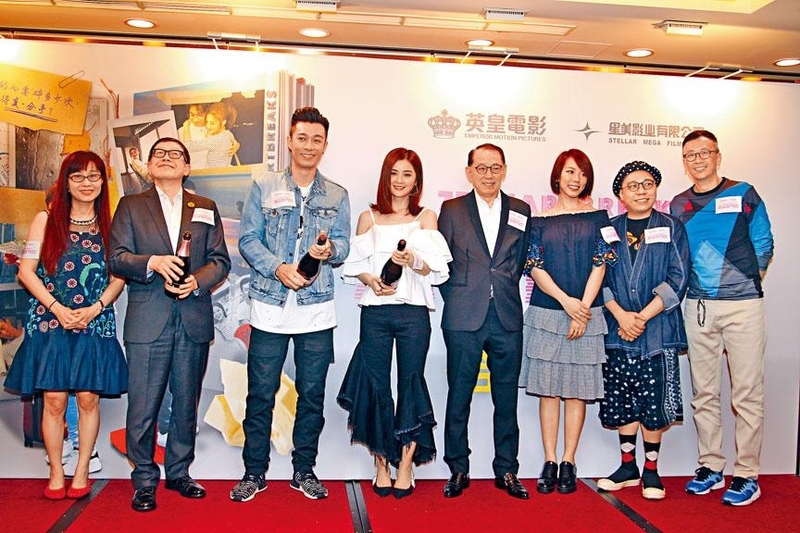 Charlene Choi Cheuk Yin, Pakho Chau, J.Arie (Lui Sum Yu), Lawrence Cheng Tan Shui, C Kwan, screen writer Erica Li Man and Emperor boss Dr. Albert Yeung Sau Sing attended. 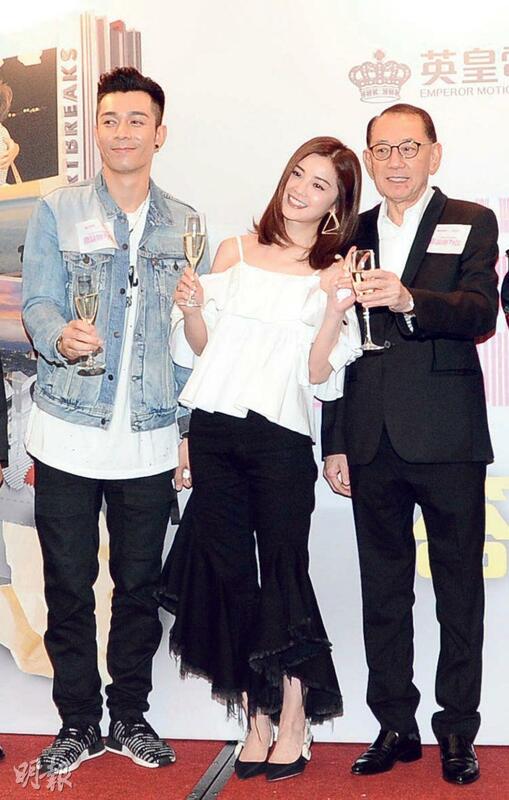 A cake cutting and champagne toast took place as they wish for the film to break HK$ 10 million at the box office. To replenish the actors' leg strength from days of audience appreciation events, they received pork knuckles and chicken feet. Pakho even fed Ah Sa. Pakho said that he was very happy the film was on top of the box office in Hong Kong two days ago and confident that it will be able to break HK$ 10 million. He will keep working hard on audience appreciation and promotions. Ah Sa said that the film will be released in the Mainland today and run into the latest TRANSFORMERS film, but she felt that it would not matter as long as it would not lose the boss' money. She said, "Making money is not my business, I got paid and that's that. (Would you like a bonus?) I do, if I negotiated it first I would." Ah Sa revealed that the boss talked about a sequel, but it would have to wait for the screen writer to finish the script. She would also have to negotiate the bonus. Pakho said, "You negotiate first, I don't dare to say too much. I am very naive." Ah Sa also revealed that while working in the Mainland earlier, boss Mr. Yeung kept sending her some pretty photos from new properties to tempt her. She asked the boss if he would give one to her. The boss said, "That's right, give me a check first!" Ah Sa said that it would be very hard. "Each unit costs nine figures, and not the start of nine figures. (Next time you could ask the boss to turn your bonus into property.) These new properties are independent homes, they really are very pretty. (Would you ask the boss for a discount?) I would have to ask his son." Pakho joked, "57% or 59%? Pick one!" Ah Sa did not get it. After Pakho explained she said, "Then 57%, the boss also told me that (Joey) Yung Cho Yi already has her eyes on it." Ah Sa's group Twins will release a new record. She said that many have been performing Side Track concerts. In the past she and Gillian Chung Yun Tung also liked non radio plug songs, so they would like the chance to perform this type of concert. Pakho was asked about Shiga Lin's contract dispute with Warner records. He said that the matter has already begun its legal procedure so he was not at liberty to talk too much about it. He also revealed that his Warner contract would end last week. As for rumors that he would join Stephen Shiu Jr.'s new record company, he said, "Later an announcement will be made. I am looking forward to a new challenge for the next ten years." Yumiko Cheng Hei Yi played Ah Sa's friend in the film. She also agreed that the film should have a sequel. She joked that she could play Ah Sa's romantic rival. "I can fight Ah Sa over her boyfriend, because in real life I wouldn't do that. We like different types, we only become friends because of that."